NEBOSH International General Certificate in Occupational Health & Safety at Green World Group. NEBOSH International General Certificate deals with offering a robust foundation in the ethics and practice of health and safety management with the goal to furnish skilled individuals to become specialists in the health and safety industry. With extensive training and guidance on all the parameters of NEBOSH IGC, a professional can Identify hazards in the workplace and tactically carry out risk review, document results, re-evaluate procedures and create a recommendations report for management. NEBOSH IGC helps to cultivate, sponsor & communicate an effective health and safety culture at the workplace. 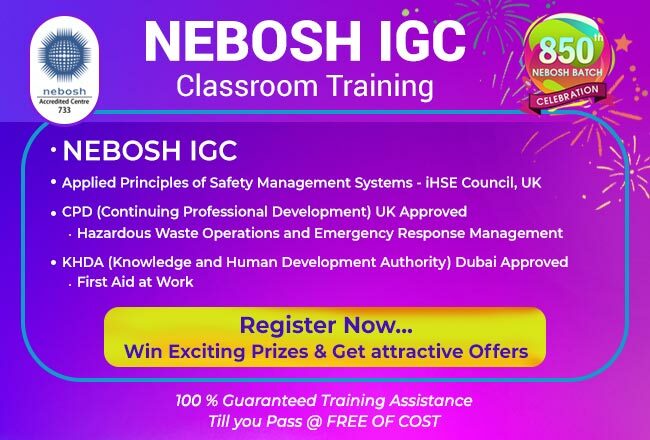 • Enroll NEBOSH IGC + IOSH MS!!.. Course Materials – NEBOSH IGC text book. The NEBOSH International General Certificate provides an excellent foundation in occupational safety and health, helping those who study it manage risk more effectively. The NEBOSH International Certificate is based on international standards and is suitable for people in any industry sector. Visit the website today to find out more , or give us call to discuss your options with one of our expert consultants. Thank you for your interest in NEBOSH! Our Course Coordinator will revert on this shortly. i did NEBOSH IGC in green word group in Angola, it was very nice and this important course for any one who want to improve on safety position. Iam pride to receve my result, i still waiting sence 01-12-2012 untill now. we do know what going one. Angelino Mufuinda Chamba. The concerned co-ordinator will revert on this shortly. The concerned Nebosh igc course co-ordinator will revert on this shortly. HELLO SIR I WANT TO LEARN SAFETY COURSE…….. I want to take admission in nebosh (igc) and willing to know the mode of payment so pl. call me. Please let us know the total cost of this course. Thanks for your Enquiry. Our marketing executive will contact you shortly. i want to IGC Nebosh. please let me your delhi address. Thanks for your enquiry. Our Marketing executive respond you soon. I want to learn NEBOSH IGC course. please let me your Delhi address, contact, guidance, assurance of completion possibilities, course fee. Thanks for your enquiry. Our Marketing executive will contact you shortly regarding this. sir i want to do nebosh course .request intimate me the fees of nebosh course. Thanks for the information. Our product specialist will contact you soon. Thank so much about NEBOSH which I did in Angola, I received my certificate today, it was nice to attended this course with you greenwgroup, anyone whom want to do this course with you, he will be pleasure to do so, as I am. By the way, one of greenwgroup said that: Greenwgroup will starting to do NEBOSH DIPLOMA COURSE IN ANGOLA. Thanks for the appreciation.!! Our Marketing executive will reply you soon regarding this. I am a safety officer in saudi Arabia but I don’t have nebosh so I want to do this course. I passed my PGD in safety and security management this year. Can I get admission for nebosh course or firsty I join job in any company then after I get admission for nebosh. Thanks for your enquiry. Our product specialist will contact you soon. Thanks for your enquiry. we will send all details in a short period of time. Thanks for your information. we will send course all details over through your mail.